The Governor signed an Executive Order declaring a State Emergency Disaster. This provides $500,000 from the Disaster Emergency Fund to pay for response and technical assessments. The State Emergency Operations Center continues to monitor the mudslide incident and resource requests. Two DHSEM Field Managers are providing on-site and direct technical support to Mesa County. The Colorado State Patrol provided initial air resources following the mudslide. The Colorado National Guard is providing air resources. Staff from the Colorado Geological Survey are onsite providing technical assistance. DHSEM has secured private sector assistance for recovery efforts. A cell on wheels (COW) secured to increase cell phone and wireless access. Army Corps of Engineers is onsite to provide technical support. The Colorado Department of Natural Resources is onsite for technical support. Governor’s Office has provided funds to purchase post event LiDAR. Technical support provided by the Colorado School of Mines. 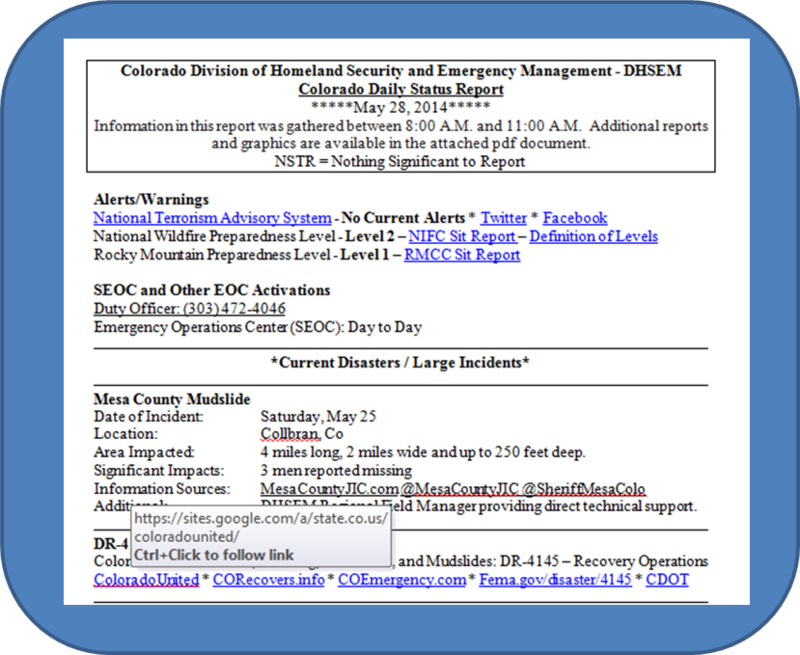 Public information and preparedness messaging from COEmergency and READYColorado sites. DENVER — Friday, May 30, 2014 — Gov. John Hickenlooper today signed an Executive Order that declares a state of disaster emergency due to the West Salt Creek Landslide in Mesa County. The order allocates $500,000 from the state’s Disaster Emergency Fund to pay for the response and technical assessments. The Executive Order also memorializes the governor’s verbal order from earlier this week to activate the Colorado National Guard to provide aviation support including flying federal, state, local and private sector personnel providing technical assistance and incident response. The order says technical assessments are in progress by the U.S. Geological Service, the Colorado Geological Survey and the Federal Emergency Management Agency. The U.S. Army Corps of Engineers will provide technical assistance with the flood risk, and CH2M Hill will also provide technical assistance on a voluntary basis. The U.S. Forest Service, Colorado State Patrol and the Division of Homeland Security and Emergency Management are assisting Mesa County and are participating in the Unified Command Post for the incident. 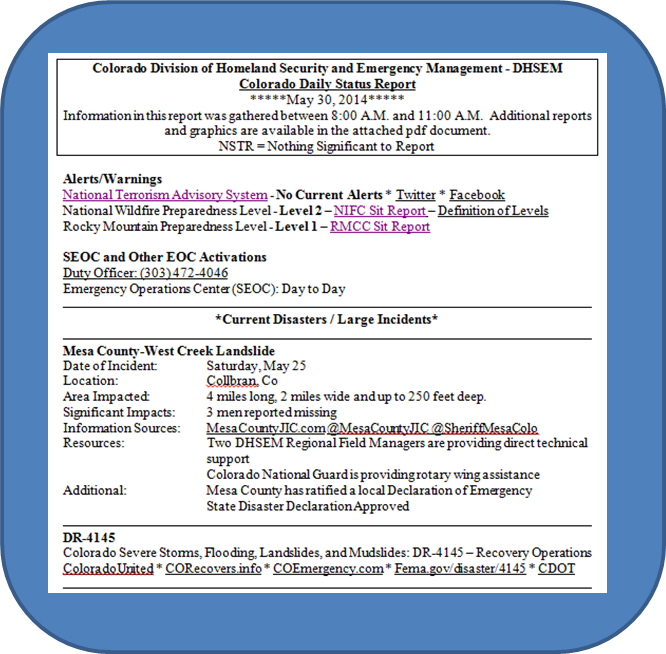 View or download the complete Colorado Daily Status Report May 30, 2014. Check the value of your insurance policy against rising local building costs each year. You do not want to be caught under-insured after a disaster. Check the limits of your insurance coverage. Will it cover floods, mudslides, landslides or mudflows? Secure coverage for risks in your area today. Basic homeowners insurance typically excludes "Difference in Conditions" such as flood, landslide, mudflow and earthquakes and may include a 30-day wait period before coverage goes into effect. The RMIIA has posted information on their website to get you started in learning more about insurance coverage. The information is posted at http://www.rmiia.org/catastrophes_and_statistics/Mudslide.asp. Landslides, mudslides and mudflow are considered different perils and require different insurance—separate from a homeowners or business policy. Landslides and mudslides are primarily earth movement, while a mudflow is caused by water picking up soil and turning into mud. With a mudflow, the primary ingredient is water, so flood insurance will typically cover parts of this loss. Click here to read about flood insurance and mudflow. A "Difference In Conditions" policy includes coverage for flood, landslide, mudflow and earthquake. Depending on risk factors, such as the slope of your property or proximity to a cliff, a homeowner with a $300,000 house can expect to pay $1,000 or more per year for this coverage. A "Difference In Conditions" policy can only be purchased through a surplus-lines carrier as a stand-alone policy. Click here for details. Separate earthquake policies or endorsements to homeowners insurance policies exclude landslides that are not caused by an earthquake. Click here to read about earthquake and insurance. Insurance is tied to the "cause of loss" or what peril caused the damage. So, any coverage you have under your homeowners or business insurance policy does not apply if the peril is excluded—flood, mudslide, mudflow, earthquake. That means additional living expenses "ALE" or business interruption is NOT covered. Flood insurance also does not cover ALE or business interruption. Also visit: Homeowners Insurance Basics. 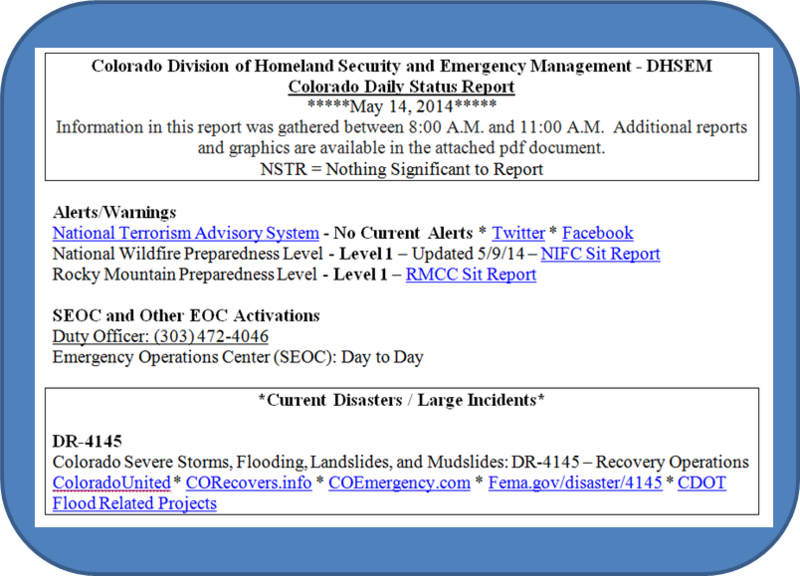 View or download the complete Colorado Daily Status Report for May 29, 2014. 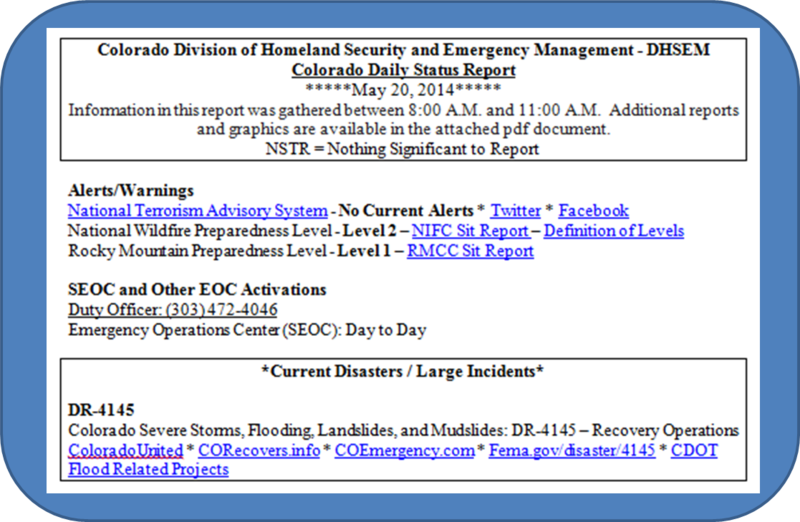 View or download the complete Colorado Daily Status Report for May 28, 2014. 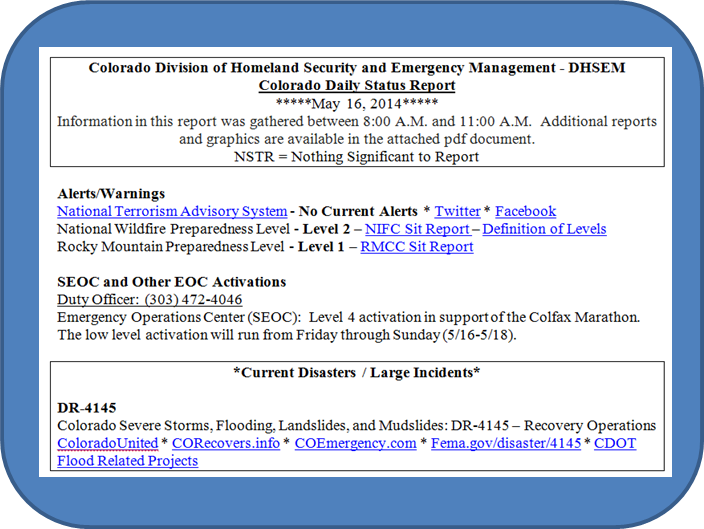 View or download the complete Colorado Daily Status Report for May 27, 2014. 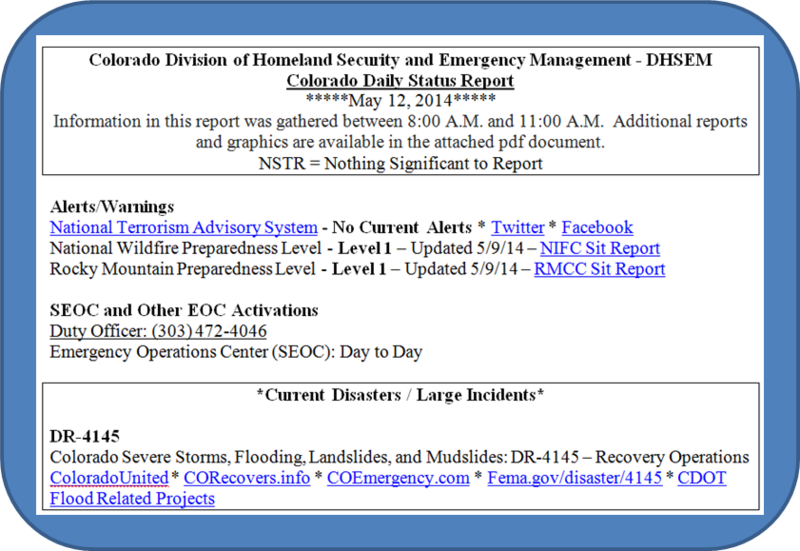 View or download the complete Colorado Daily Status Report for May 23, 2014. 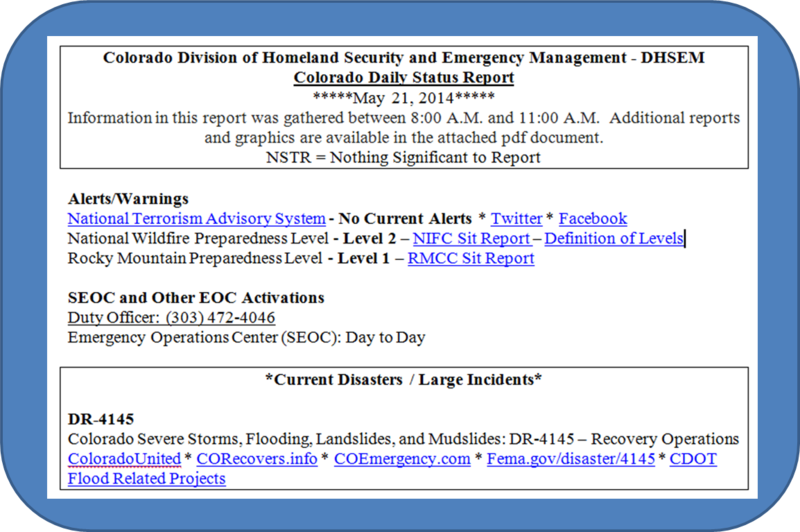 View or download the complete Colorado Daily Status Report for May 22, 2014. 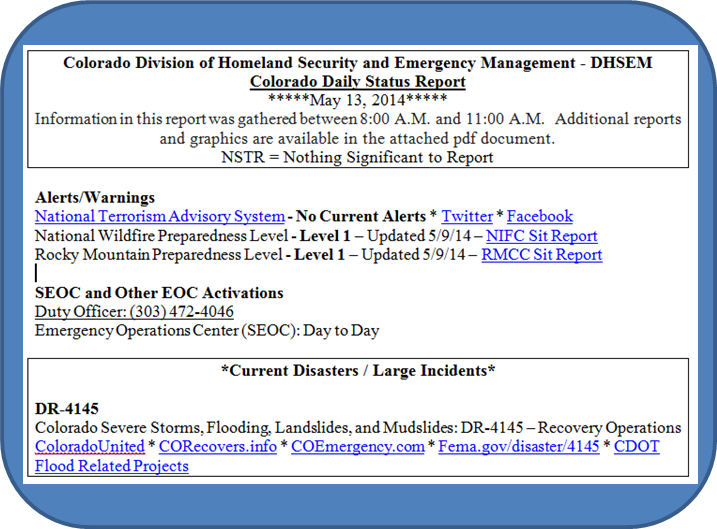 View or download the complete Colorado Daily Status Report for May 21, 2014. Fire officials with the Upper Colorado River Interagency Fire Management Unit (UCR) plan to conduct prescribed burning in the Nick Mountain/Bald Mountain area beginning Wednesday, May 21. Approximately 986 acres consisting of Bureau of Land Management and Forest Service managed lands are planned to be burned. Fire officials anticipate that burning activities will include establishing an enhanced fireline around the area by “burning out” vegetation immediately adjacent to the constructed fireline. Continuing on Thursday, May 22, fire officials anticipate aerial ignition using a helicopter to burn the remainder of the unit(s). The Nick Mountain prescribed burn unit is located approximately 4 to 5 miles southeast of Molina, Colorado. Plans call for burning in mixed mountain shrub ecological communities to promote wildlife habitat. Five UCR engines and approximately 30 firefighters will be on the burn to manage activities and ensure that the burn is accomplished safely and with the prescribed burn plan parameters. A detailed burn plan outlines the parameters for the prescribed burn and contains specific criteria regarding weather conditions, staffing and air quality that must be met to help ensure control of the burn as well as to minimize the potential smoke impacts to local communities. A Smoke Permit has been obtained from the Colorado State Air Pollution Control Division for the burn and identifies conditions for implementation. Smoke may be visible in the Plateau Valley area for a few days during and after the burn as vegetation continues to smolder. Fire crews will continue to monitor the area following completion of the burn to ensure public safety. Previous notice of this planned burn can be found at: http://tinyurl.com/nwfyngk. For additional information visit http://gacc.nifc.gov/rmcc/dispatch_centers/r2gjc/ or follow the agency on Twitter at @UCRFireCenter. As Coloradans learned in September 2013, heavy rains along the Front Range can lead to extensive flooding. And, as many people have learned, recovering from floods can be a difficult task. Now as the weather warms, state and federal officials are keeping a wary eye on snow melt and the potential for spring rains. As part of their preparations, officials continue to urge flood insurance policyholders to make sure they understand what provisions are in their coverage. One part of the policy that might be especially important is the Increased Cost of Compliance (ICC). NFIP policyholders who are rebuilding after 2013 flood may be eligible for up to $30,000 in ICC funds to cover the cost of bringing the home or business into compliance with local floodplain ordinances. ICC coverage is included as a part of the Standard Flood Insurance Policy. A building is considered to be substantially damaged when the total cost of repair equals or exceeds 50 percent of its pre-disaster market value. A building is considered to have sustained repetitive damage when it has been damaged by floods twice over a period of 10 years, and the cost to repair the damage, on average, equals or exceeds 25 percent of its market value at the time of each flood event. This applies only if the participating community has a repetitive loss provision in their floodplain management ordinance, and an insurance claim payment is made for each of the two flood losses. To find out if your community has a repetitive loss provision, contact local officials or your insurance company. Demolish: Tear down a flood-damaged building. Claims for ICC benefits are filed separately from contents or building loss claims. A claims representative will be assigned to help prepare the ICC claim. For more information on flood insurance or ICC coverage, visit floodsmart.gov or call 1-888-379-9531. Remember that NFIP policies go into effect 30 days after purchase. The time to buy is now. Pending favorable weather conditions, Upper Colorado River Interagency Fire and Fuels Management crews and partners will conduct a prescribed burn this spring on the north aspect of Battlement Mesa, roughly seven miles from Parachute, on National Forest System lands near Garfield County Road 306. The prescribed burn is expected to occur around the end of April or early May. Up to 2000 acres of Gambel oak and mixed mountain shrub vegetation will be ignited to benefit wildlife habitat. “Prescribed fire is effective for stimulating sprouting of Gambel oak and other shrubs, which improves browse for big game and other native wildlife. There is also a need to open up some areas within bighorn sheep range to improve foraging habitat and site distances”, said Natasha Goedert, Forest Service District Wildlife Biologist. The intent of the project is to promote nutrient recycling of fire-adapted vegetation communities, to provide an improved food source for wildlife, and to create habitat conditions that will encourage wintering deer and elk to stay on public lands longer by improving the big game winter range. A secondary benefit of the project will be reduction of fuel loads in the mountain shrub vegetation across the project area. “This project is part of a large-scale effort being conducted over a 5 to 10-year period in partnership between the Forest Service, Colorado Parks and Wildlife, Rocky Mountain Elk Foundation, National Forest Foundation and other partners to improve habitat for bighorn sheep, elk, mule deer, and other native wildlife across approximately 115,000 acres on the White River National Forest. Colorado Parks and Wildlife has pledged financial support to assist the cost of federal fire crews and Grand Valley and Plateau Valley Fire Protection Districts plans to participate with the prescribed burn. Information regarding this project and the objectives of the work is available at the Forest Service office at 0094 County Road 244, Rifle, CO., or by calling Kim Potter, 970-625-2371. 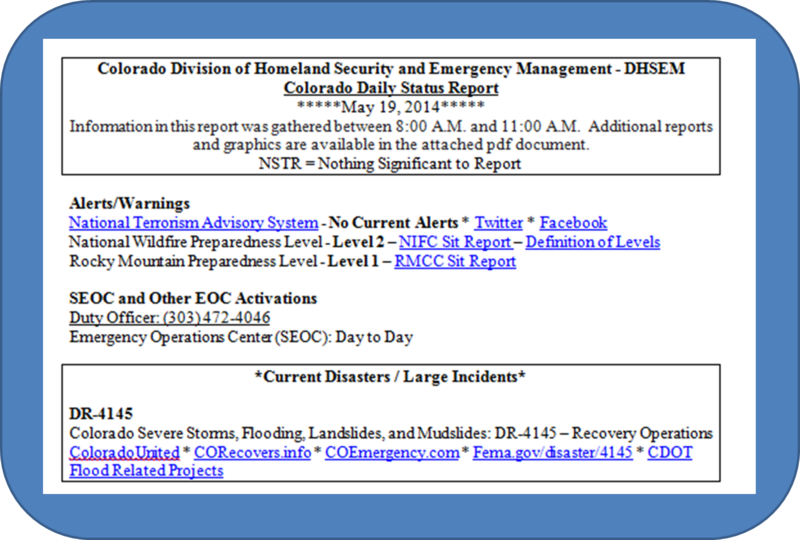 View or download the complete Colorado Daily Status Report for May 20, 2014. A year ago today, on May 20, an EF5 tornado struck Moore, Oklahoma, killing 24 and leaving a 17-mile trail of destruction. Later this week, May 22, will be the sixth anniversary of the EF3 tornado in Windsor, Colorado, that killed one person, was on the ground for 39 miles and was up to a mile wide. The twin anniversaries are a poignant reminder of the importance of preparing for tornadoes, point out emergency managers from the Colorado Division of Homeland Security and Emergency Management and from the Federal Emergency Management Agency (FEMA). Colorado gets an average of 40 tornadoes per year, which ranks the state ninth in the country for number of tornadoes. The highest number occurs in June, followed by July and May. The worst threat is along the heavily populated Front Range and foothills corridors. Maintain an emergency kit or check list of emergency items to take with you. Develop a family communication plan in case your family is separated. Identify a safe shelter location. A basement is best, followed by interior rooms on the lowest level of the building away from windows. Mobile homes are often unsafe in a tornado – identify a neighbor's house or public shelter where you can go if a tornado warning is issued. Obtain a NOAA Weather Radio to receive alerts about impending severe weather. Sign up for reverse telephone alerts for your county, and don’t forget to include your cell phone. Make sure you have sufficient insurance coverage – including flood insurance, which is separate from your homeowner’s policy. Photograph or video the contents of your home in case you need to file a claim. Store copies of your important documents in another location, such as a bank safe deposit box. Consider building a safe room inside your home. Immediately go to your pre-identified safe shelter – there is no time to gather possessions. If possible, crouch under a sturdy piece of furniture, such as a table. Cover your head and neck with your hands and arms. If you are outside and no other shelter is available, get in a vehicle and drive to shelter if possible. Keep in mind that you won't be able to outrun a tornado. If you must use a vehicle for shelter, keep your seatbelt on, cover your head and keep it below the window level. Do not use an overpass or bridge for shelter. If no other shelter is available, lie in a low spot and cover your head, but be alert for water filling the location. Avoid downed power lines and leaking gas lines – report them to your utility company. Watch for broken glass, nails, and other sharp objects. Avoid damaged buildings until they are declared safe by officials. Notify your family that you are safe – phone lines may be down, so be prepared to send text messages. Check property for damage and contact your insurance company to file a claim, if necessary. Research shows that most people wait until bad news is confirmed by a second source before taking action. With tornadoes, act first, emergency officials warn. Take shelter yourself, then be the second source that confirms the emergency for others by phone or social media. FEMA’s Ready.gov website cites a study of tornado damage in Marion, Illinois, that showed half of all tornado-related injuries came after the tornado, from rescue attempts, clean up, and so forth. Almost a third of the injuries came from stepping on nails. Be very careful when entering any damaged structure, and use battery-powered light if possible rather than candles to minimize the danger of fire or explosions. A timeline of some of the most significant tornadoes to affect the six-state region covered by FEMA’s Denver regional office, with links for more information, is available at http://www.fema.gov/fema-region-8-tornado-timeline. 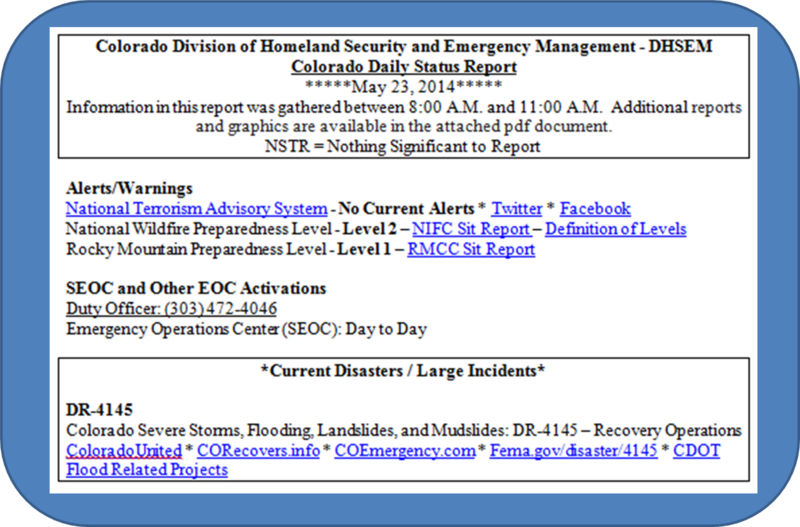 View or download the complete Colorado Daily Status Report for May 19, 2014. View or download the complete Colorado Daily Status Report for May 16, 2014. 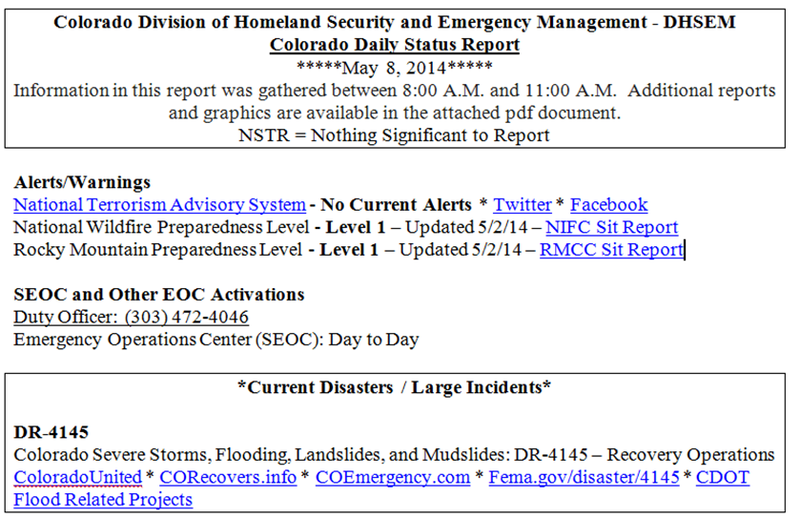 View or download the complete Colorado Daily Status Report for May 15, 2014. DENVER—As residents and local officials in communities across the state prepare for the possibility of spring flooding, state and federal emergency management officials are gearing up for what could be another round of severe flooding in Colorado. In the past weeks, officials have stepped up preparedness measures in anticipation of a potentially busy season, given high snowpack in parts of the state and the prospect of runoff and storms through areas still vulnerable from last September’s floods. Created an interactive hazard map on READYColorado.com for Colorado community members to learn more about hazards in their area and what to do before, during or after a disaster hits. DHSEM hosted a spring runoff forum for emergency responders. Conducted a state-federal exercise at the Joint Disaster Field Office on April 18 to review the current flood outlook, discuss interagency coordination and anticipate potential issues and response operations in advance of spring flooding. Released new floodplain delineations based on post-flood LiDAR aerial surveys to show potential impacts from flood waters, including impact assessments of structures located within the 100-year floodplain. Increased engagement of Debris Task Force Teams using topographical data to compare pre- and post-flood surveys in order to identify potential flooding hazards. Coordinated with community and county officials to fund the removal of hazards from more than 100 streams in Boulder, El Paso, Larimer and Weld counties, unblocking key waterways. These efforts are ongoing. Developed strategic plans and staffing patterns in order to transition current recovery operations into a new flood response, if needed. Developed plans to conduct Preliminary Damage Assessments so teams can move quickly into the field to conduct ground surveys, if needed. Increased monitoring of weather conditions in coordination with the National Weather Service (NWS), including a Potential High Water Conference with the state and NWS to consider flood risk in northwest Colorado – an area not affected by last September’s flood, but which could experience flooding this spring. Also, the State has completed a system of emergency alerts and safety protocols when flash flooding threatens the area of Hwy. 24, in coordination with NWS. Expanded outreach to local communities to provide spring flood mitigation information and the benefits of purchasing and maintaining flood insurance. Developed a State-FEMA Situational Awareness Team and reviewed coordination plans for State-FEMA Incident Management Assistance Teams. News release posted for City of Ouray, Colorado and County of Ouray, Colorado. Ouray, Colo - Pamela Larson, the Mayor of Ouray, Colorado, has sent a declaration of economic disaster and emergency to Governor Hickenlooper, requesting assistance on behalf of the City’s business community. The Mayor made the declaration on Monday May 12, 2014 at 6:00pm. The City Council will ratify the adopted the emergency declaration at its meeting on May 19, 2014 at 7:00pm. The Board of County Commissioners for Ouray County also passed a resolution in support of the City’s declaration at its meeting on May 13, 2014. An economic emergency arises when conditions beyond the control of the community result in economic hardship. Such a declaration paves the way for federal and state assistance, including loans from the federal Small Business Administration. The emergency declaration results from a massive landslide earlier in 2014 that has closed Highway 550 through Red Mountain Pass for extended periods of time. The road is currently under construction by Colorado Department of Highways to repair damage and to place chain covers over areas most susceptible to rock movement. While the construction is appreciated, and necessary to prevent future disastrous slides, closure of the road in the beginning of tourist season, after having also been closed for extended periods over the winter, has had a very detrimental impact on local businesses. Red Mountain Pass connects the City of Ouray to the Town of Silverton and is the main route between southern Ouray County and San Juan County. The road is heavily traveled by both locals and visitors during the summer. Those visitors often spend time in the City of Ouray and elsewhere in Ouray County, en-route to Durango or other destinations to the south, including Mesa Verde. Businesses count on these visitors for business during the relatively short summer season. The City also hopes to heighten awareness that the highway us open to the City of Ouray. Various signage along the highway has been limited and somewhat confusing on that point. “We are open for business and looking forward to a strong summer visitor season. Most jeep trails, hiking areas, fishing access and other recreational opportunities are available during the highway construction. We encourage the public to come and visit us,” said Mayor Larson. Any questions regarding highway closures should be directed to CDOT. Any question regarding access to businesses and recreation sites should be directed to Glenn Boyd. The Colorado Division of Homeland Security and Emergency Management is excited to announce a new member of the Mitigation and Recovery Section. Sean Settle recently joined the team as a Mitigation Specialist. He will be working to support our local and state partners with all aspects of mitigation including project development, multi-hazard planning and grant management. Settle has been involved with emergency management since 1997 which includes 1,500 hours of Search and Rescue Operations and six years of incident command and planning experience throughout Colorado. His unique background in emergency coordination, multi-hazard planning, public speaking and project management makes him a great addition to the Mitigation Team. He has worked with variety of city, county, state and federal agencies for intergovernmental continuity and mass casualty planning. He earned an undergraduate degree in Aerospace Operations from Metropolitan State University of Denver and holds 10 professional certifications through FEMA. Settle previously worked for the Arapahoe County Public Airport Authority and the City of Colorado Springs before joining the DHSEM in 2014. 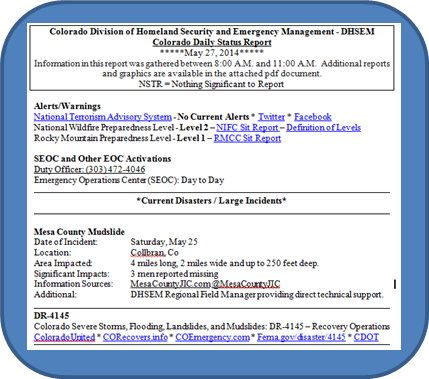 View or download the complete Colorado Daily Status Report for May 14, 2014. 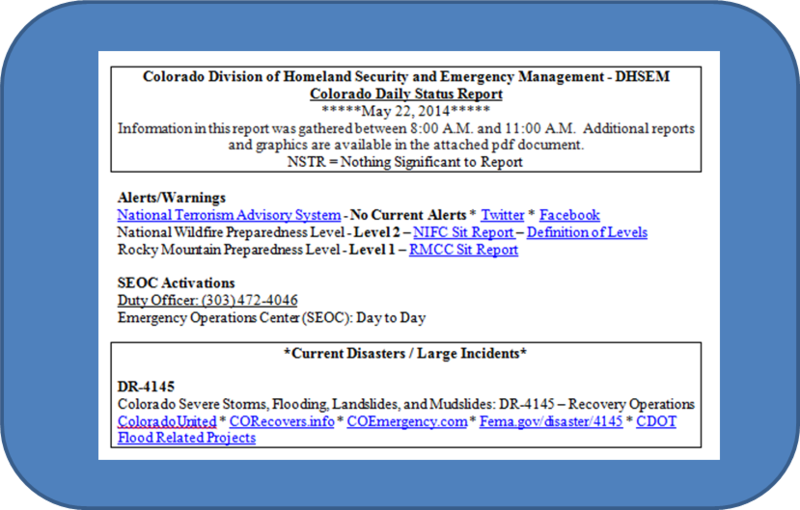 View or download the complete Colorado Daily Status Report for May 12, 2014. Colorado law; specifically Section 24-33.5-1227 (3) (a), C.R.S. 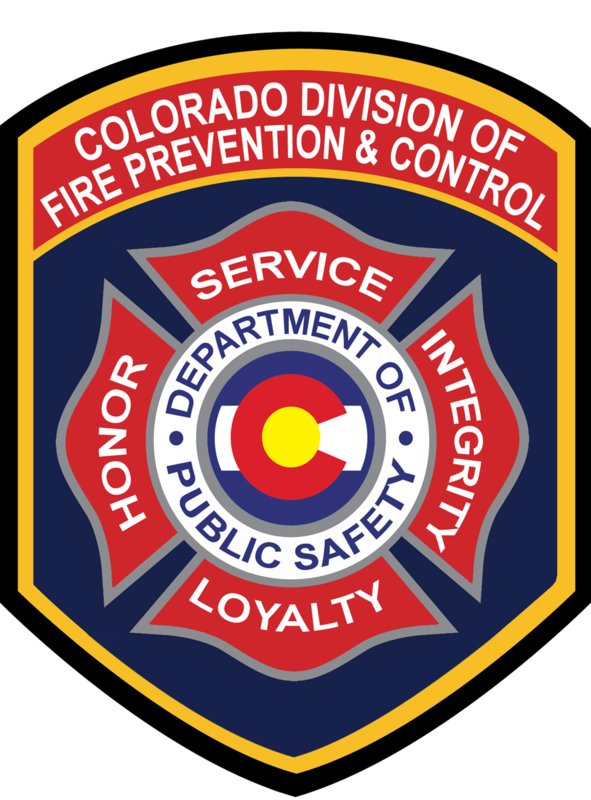 requires the Director of the Division of Fire Prevention and Control to develop an annual Wildfire Preparedness Plan, in collaboration with a representative of the County Sheriffs of Colorado, a representative of the Colorado State Fire Chiefs' Association, the Director of the Office of Emergency Management and the Adjutant General. (5) A process for ordering and dispatching aerial firefighting equipment and personnel that is consistent with, and supportive of, the statewide mobilization plan prepared pursuant to Section 24-33.5-705.4, C.R.S. The Wildfire Preparedness Plan shall also provide recommendations on the use of the Wildfire Preparedness Fund created in §24-33.5-1227 (1) (a), C.R.S. 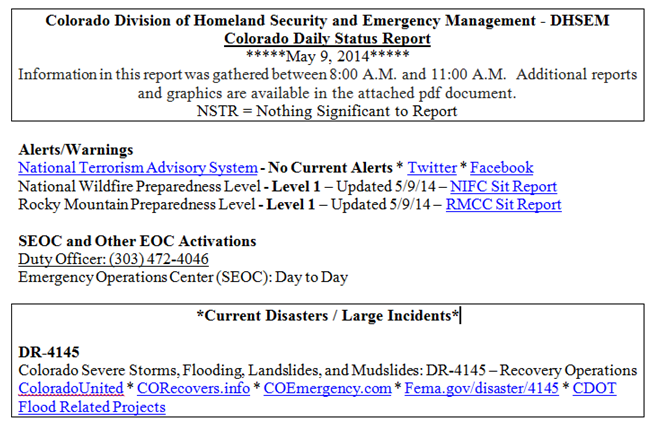 View or download the complete Colorado Daily Status Report for May 9, 2014. CENTENNIAL, COLORADO - May 12, 2014: The Governor’s annual wildfire briefing has been scheduled for May 12. The Director of the Colorado Division of Fire Prevention and Control will brief the Governor on the Wildfire Potential for 2014 and the level of state preparedness. 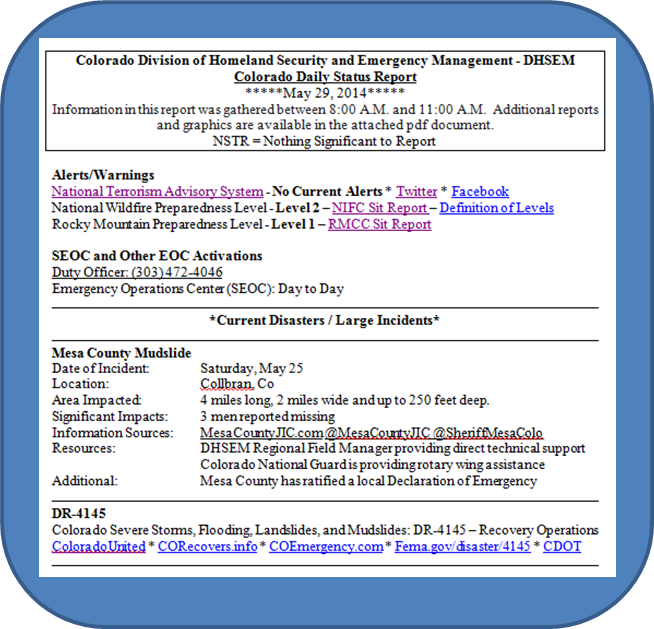 Additional updates will be provided from the USFS Deputy Regional Forester and the State Fire Management Officer for the Bureau of Land Management in Colorado. After the Governor is briefed, the group will provide a media and community briefing in Hangar A. The Wildfire Preparedness Executive Order will be signed during the media briefing. Park in the big lot just outside of the Jet Center. Check in at the desk to gain access to the hangar. The Colorado DHSEM Mitigation Team is now accepting Notice of Intent (NOI) forms for the 2014 Hazard Mitigation Assistance (HMA) Program grants, including the Pre-Disaster Mitigation Program (PDM) and Flood Mitigation Assistance Program (FMA). These grants represent an opportunity to improve a community’s ability to mitigate natural hazards and reduce potential impacts on citizens, property and local economies. NOIs will be evaluated for eligibility and alignment with HMA program priorities as laid out in the fact sheets linked below. The Mitigation Team will invite jurisdictions to complete a full grant application as appropriate. Similar to last year, the timeline for application development is significantly shorter than in previous years. The compressed timeline suggests that the most competitive projects will be those in alignment with Federal program priorities, previously scoped, in pre-design, and with a well-established cost estimate. May 30, 2014 – Notice of Intent forms due to DHSEM. June 13, 2014 – Notice of Intent reviews complete. July 3, 2014 – Benefit-Cost Analysis complete. July 22, 2014 – Subapplications completed in eGrants. July 25, 2014 – State application completed in eGrants and submitted to FEMA. Please take a thorough look at the program webpages and grants.gov sites as linked above, as well as the FFY 2013 Hazard Mitigation Assistance Unified Guidance which remains the current guidance. Contact Ken Brink, Mitigation Team Supervisor, with questions or comments at kenneth.brink@state.co.us or 720-852-6695. 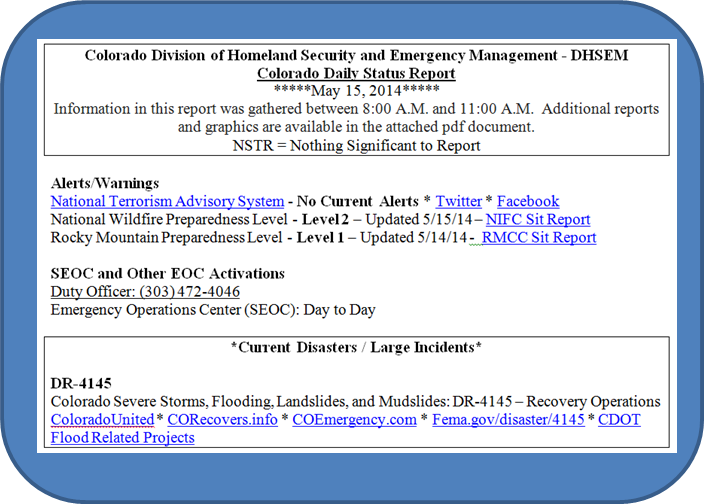 View or download the complete Colorado Daily Status Report for May 8, 2014. Rebuilding after a disaster can present opportunities as well as challenges. The challenges include getting the job done quickly and efficiently. The opportunities involve rebuilding stronger and better. When it comes to repairing and rebuilding infrastructure damaged in last September’s floods, FEMA’s Stafford Act Section 406 can provide mitigation funds for risk-reduction improvements to roads, waterways, bridges, dams, buildings and other public structures already eligible for Public Assistance reimbursement. Mitigation projects are being undertaken throughout the 18 Colorado counties designated eligible for FEMA Public Assistance, particularly in Boulder, Larimer and Weld counties. The goal is to reduce risk, reduce damages, and reduce the threat to life and property from future flooding events. As Coloradans continue recovery efforts, nearly 200 Public Assistance repair projects now include some form of Section 406 mitigation. Many of these projects involve “armoring,” or shoring up, stream banks scraped and weakened by the flooding. Workers are also elevating electrical equipment out of harm’s way in public buildings and in the field, and doing what they can to strengthen piers and other supports under bridges. FEMA typically reimburses at least 75 percent of eligible costs for projects that return infrastructure to its pre-disaster condition. Under certain circumstances, FEMA can also fund Section 406 mitigation measures as long the project is cost effective. Most types of mitigation projects in this disaster recovery can be considered cost-effective and eligible for funding if they are performed on disaster-damaged infrastructure and reduce the potential for damages from similar events in the future. Cost-effectiveness, along with other conditions for eligibility, are determined on a case-by-case basis. Applicants for 406 mitigation should consult with their FEMA Public Assistance Coordinator for more detailed information and guidance. 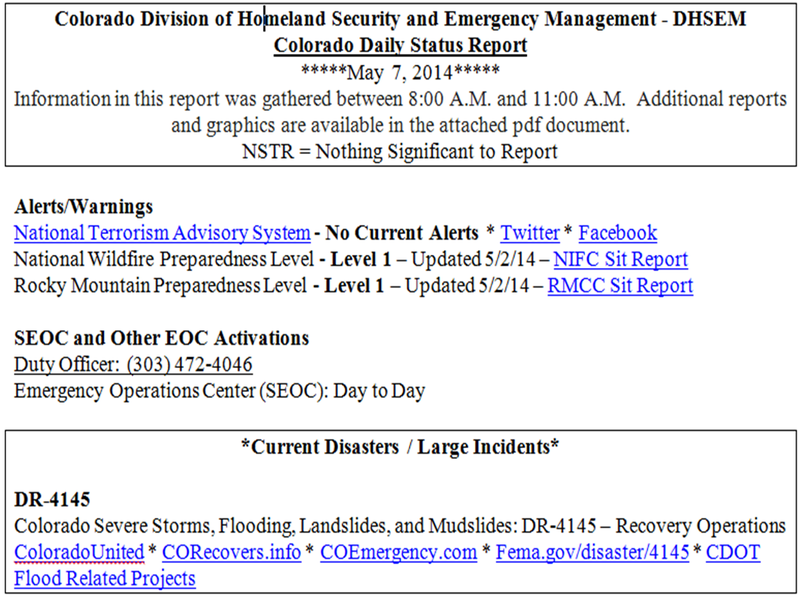 View or download the complete Colorado Daily Status Report for May 7, 2014. Joint news release from the Pueblo Joint Information Center. The Pueblo Chemical Stockpile Emergency Preparedness Program (CSEPP) exercise will be held on Tuesday, May 6. The exercise is scheduled to start at approximately 3 p.m. and conclude around 8 p.m. This annual event has been designed to test participants’ response capabilities to two simulated emergencies and to have that response effort federally evaluated. Over a dozen agencies, local, state, and federal will demonstrate their capabilities in the afternoon exercise. Participants include the American Red Cross, ACOVA, Colorado Department of Public Safety, Pueblo Animal Services, Pueblo Parks Department, the U.S. Army Pueblo Chemical Depot, Pueblo County Sheriff’s Office, City of Pueblo Police and Fire Departments, Rye Fire Department, Pueblo West Fire Department, Pueblo Rural Fire Department, local hospitals and more. The exercise scenario will involve a simulated chemical incident at the U.S. Army Pueblo Chemical Depot and another non-related emergency within the city limits of Pueblo. The mock events will be large enough to require the activation of the new Pueblo County Emergency Operations Center, the Pueblo Community Joint Information Center, field decontamination and treatment facilities, as well as shelters for displaced citizens and their household pets. The public will see exercise related activity at several locations but should not be alarmed. The exercise may appear very realistic, responders will be dressed in full protective equipment and some actors who will be playing accident victims will receive realistic looking injury make-up. The majority of publically visible activity will be in the southwest corner of Pueblo City Park (Pueblo Boulevard and Thatcher Ave) but additional emergency equipment and vehicles will be deployed to the other sites including, the U.S. Army Pueblo Chemical Depot and Central High School. To evaluate the community’s ability to notify the public in a timely manner, officials will launch a telephone call into the homes and businesses near Pueblo Boulevard and Thatcher Avenue the evening before the exercise. Responders will also practice door-to-door and patrol car public announcement capabilities during the events and the residents around the U.S. Army Pueblo Chemical Depot may hear tone alert radio activations and test tones from the sirens that surround the post. The State Emergency Operations Center will also activate this afternoon in support of the full scale exercise.